Making a data management plan and organizing your data from the beginning of your project will save you enormous time, money and energy. Many funding agencies require submission of data management or data sharing plans with grant applications and annual reports. 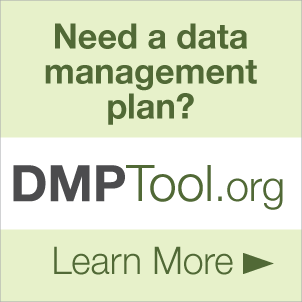 A Data Management Plan (DMP) details how data will be identifiable, accessible and documented for deposit, sharing and reuse. Organizing your data is not simply naming files and folders so that only you and/or your research team understand their content. Organizing your data means putting standards and guidelines into action that will satisfy funder requirements, allow for future data sharing, document detailed metadata for better data discovery and illumination, and develop codebooks/data dictionaries to ensure the value and accessibility of your research long after your project is complete. This document serves as a general, research data management-focused guide to employee/trainee onboarding as they join a new lab or begin new projects. This checklist focuses on three main areas of the research project: planning, storage and sharing. Internal and external links have been provided as supplementary resources, including a glossary of terms. This document navigates through the entire lifecycle of a research project, and serves as guide to the steps and tasks you should think about or complete at every step of the research process. Use this document as a reference checklist to keep track of good research data management elements important to your research project.